This general ledger sample provided here shows you how to enter account information with designated columns for debits and credit as well as balances. This example of a general ledger is titled ‘Trial Balance.’ You can use this general ledger sample for your reference. Once you have downloaded our general ledger sample, you can edit the example general ledger based on your company’s needs. This general ledger sample can also be used to manage personal expenses. For example, you can create a general ledger for a category of expenses that you incur such as food, gas, travel and other miscellaneous categories. Ideally, by using this general ledger example, you can compare your monthly expenses in each category against your monthly income. This general ledger sample was designed to clearly depict individual account balance details. Generally speaking, a general ledger summarizes all accounting transactions that occur in a business. It is important to keep track of your general ledger so that all financial transactions can be accurately accounted for. Accountants may use a general ledger to track sources for financial expenses and to solve any issues that may arise. You can also do this for personal expenses. Our general ledger is free to download and ready to use. In the example general ledger that we have constructed for you, the balance column is already formulated to show the difference in debit and credit for each sub-account category that you enter. The balance column is located on the far right side of the general ledger example and shows the total balance for each individual account. At the bottom of the general ledger sample, total debit, total credit, difference and ending balance are also pre-formulated. Positive and negative values are also color-coded in this general ledger sample. 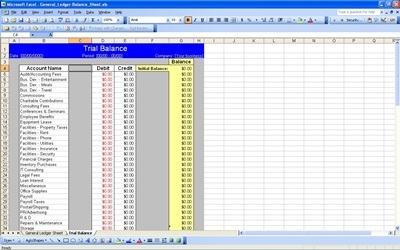 Enjoy this free general ledger sample provided by Exceltemplates.net. You can also find other example general ledger templates by browsing our library of free Excel templates. This general ledger example is compatible with both Excel for Mac and Windows.